.thing has built in magnetometer! so i got my magnetometer app back! i can coil the steel up and wrap it with magnetic wire. got to get a few more car parts first though. lol,ive been pricing corvettes lately.salesman linked me to cheap cars since my credit sucked.so man gets rejected corvette,builds ufo instead! this is the wire im getting.its got really good insulation for high temperatures.plus its got different sizes so i can perfect my test. So glad things are moving along in a positive direction, robo!!! Looking forward to the end result! i think i had some minor success.i was sitting here thinking about my incomplete caduceus coil sitting over in the corner.i took a wire and connected it to caduceus base and to ground on vdg generator.then i tried to spark to caduceus top center tube from vdg.while wearing new rubber gloves,i got pulses of air on my statically charged hair on arm.i think i had my first positive result! lol,the caduceus was positively charged positive! so i have come closer to the goal.the spark shorted out just like it would from plumbob to caduceus.thus creating a temporary short and recharge.creating a magnetic field in the coil.this made a pulse in the ions near my arm.which felt to be about ten times to a hundred times in force compared to just hair on arm standing up.it felt like a pulse wave.very weak but still a pulse that could be felt.it also killed my blutooth wifi dot.i had to unplug it and plug it back in.it totally emp'd it! just like cars by ufos in the old days.so i feel im going in the right direction.im about to try same thing with my giant wire coil that had amp hooked to it to see if i get result.thing is, insulation on wire should break down from high voltage where as caduceus has windings of steel tubing spaced two inches apart and insulated by air. i think i would have had better results if caduceus top was polished smooth because i kept getting positive coronas forming on sharp edge of caduceus with occasional sparking.i wore gloves to make sure it wasnt just the spark traveling through me and making me think it was pulses when it could have been shocks.i did feel my arm hair moving.if i had a feather or pinwheel i could have video'd results.thing is could have just been static field collapsing upon short and rebuilding but i felt a force of some kind. So cool!!! Hope to see it operational soon! And maybe something will be found to demonstrate it! wow,this thread has over 21,000 views! 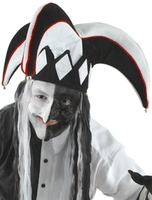 no thats not me but the jester hat is fitting for this thread! do you follow Ken Wheeler at all? Quite a character, Ken is! I agree with Him, though. Except the part where He evaluates Us as dim for beLIEving what We are taught in "school." The indoctrination runs VERY deeply, from birth, and to expect Us to rise above it naturally is a poor expectation. They teach what They teach because it does NOT predict energy from the aether, which, certainly, would remove the psychopaths' power over Us if We had free energy. I wonder what His thoughts are about Dr. Paul A. LaViolette's subquantum kinetics (SQK)... It sure predicts what We see well (and works in a Euclidean layout - no "bending space..."). i dont understand some of laviolettes stuff but his ufo functions seems spot on. anything with quantum in it,i dismiss.if you cant use it in everyday life,to perform some usable function.what meaning does it support? I agree, robo, but with a good model, One can predict things - as SQK predicts the Biefeld-Brown effect, which is the foundation of electrogravitics. They have been using a poor model for a long time. Agreed, radek. "Quantum" seems mostly to be about math... LOL! Though I do ponder the double slit experiment. I have never done it, but it seems a fair Few have, and gotten the same results. So... I give fair probability to its being a real thing. But no doubt other models than the one They gave Us that has no aether or energy therein would explain that experiment. Yes - the old double slit experiment... but then thats assuming that an electron is a 'particle'; if it was a wave - well more of a disturbance of the aether, or possibly 2 'particles' as Distinti models it then the world is happy again. So many models to choose from - the only 1 I am certain is wrong is the current mainstream one. Yes. The whole einsteinian drek with bending space and all. I do like that SQK is predicting ALL the einsteinian "mysteries," and goes in hand with the electric universe. And it works in a Euclidean space... I give good probability that LaViolette is onto something with it. why cant a particle have wave properties? i think double slit was to be an end all be all designed to distract from mhd. which is also a tank circuit in resonance.same exact function with two separate names. Thanks for the data, robo! post office tracking says its not even recieved magnet wire,yet has tracking number.i email company and they say it should be delivered today.it was not. well the post office fucked up and lost the package!!!! so company is going to use ups instead this time.i was about to pay overnight but it would be an extra 90$. i had a three day weekend this weekend and was gonna do my test but post office screwed me on that! never trust usps,they have continually let me down on their shipping services. reshipped via ups overnight air.but ups doesnt deliver on saturdays to my locale,so monday.remington industries was very helpful. I don't trust the post office one little bit - nor UPS. They lost one of the two things I sent to Georgia the first time I went there and I got nothing from Them for having lost My down comforter, down pillows, and all My coats. I will use FedEx next time. got wire on time.this morning,had separate package that was to be delivered ups that got routed through post office.got notice it was too big for mailbox and must be picked up in person.wow i thought it was to be delivered to doorstep.i guess the post office is defrauding me again. the original order through usps showed up today.one week late. Well, I guess You're on Your way! Whichever wire You use. Glad to hear! ive decided to keep my wire length short,to go with 32awg wire.the amp needs 4 ohms resistence. to get the current output without creating an explosion.ill need 166 bundles.with each bundle being 24 feet ,wrapped on my new steel bobbin.my bobbin is thin silicone steel of about ten feet.wrapped into a circle then wrapped with clear packing tape to hold it all together.i have an extra piece if needed.its four inch wide strips and after wrapping into coil,appears to be about 3/16 inch thick.the coil circumference measures out to about 48 inches/4 foot.